ST. GEORGE was born in Cappadocia, at the close of the third century, of Christian parents. In early youth he chose a soldier’s life, and soon obtained the favor of Diocletian, who advanced him to the grade of tribune. When, however, the emperor began to persecute the Christians, George rebuked him at once sternly and openly for his cruelty, and threw up his commission. He was in consequence subjected to a lengthened series of torments, and finally beheaded. There was something so inspiriting in the defiant cheerfulness of the young soldier, that every Christian felt a personal share in this triumph of Christian fortitude; and as years rolled on St. George became a type of successful combat against evil, the slayer of the dragon, the darling theme of camp song and story, until “so thick a shade his very glory round him made” that his real lineaments became hard to trace. Even beyond the circle of Christendom he was held in honor, and invading Saracens taught themselves to except from desecration the image of him they hailed as the “White-horsed Knight.” The devotion to St. George is one of the most ancient and widely spread in the Church. In the East, a church of St. George is ascribed to Constantine, and his name is invoked in the most ancient liturgies; whilst in the West, Malta, Barcelona, Valencia, Arragon, Genoa, and England have chosen him as their patron. Reflection.—“What shall I say of fortitude, without which neither wisdom nor justice is of any worth? Fortitude is not of the body, but is a constancy of soul; wherewith we are conquerors in righteousness, patiently bear all adversities, and in prosperity are not puffed up. This fortitude he lacks who is overcome by pride, anger, greed, drunkenness, and the like. Neither have they fortitude who when in adversity make shift to escape at their souls’ expense; wherefore the Lord saith, ‘Fear not those who kill the body, but cannot kill the soul.’ In like manner those who are puffed up in prosperity and abandon themselves to excessive joviality cannot be called strong. For how can they be called strong who cannot hide and repress the heart’s emotion? Fortitude is never conquered, or if conquered, is not fortitude.”—St. Bruno. On Sunday, April 10, during the SSPX pilgrimage to Le Puy, Bishop Fellay commented on his recent visit with Pope Francis. 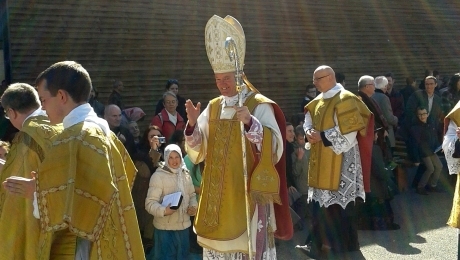 On Sunday, April 10, 2016, Bishop Bernard Fellay celebrated Mass at the end of the pilgrimage in Le Puy. In front of 4,000 SSPX pilgrims, he commented on his recent visits to Rome. Despite the new Exhortation Amoris Laetitiae which “bring us tears”, he revealed some good news from his meeting on April 1 with Pope Francis. According to Le Salon Beige, Bishop Fellay said that the Pope considered the SSPX Catholic, that he had no intention to condemn it, and that he wanted to extend the jurisdiction of SSPX priests, beginning with the faculty for confessions. During his meetings in Rome, Bishop Fellay has even been encouraged to open a seminary in Italy. On April 1, 2016, Pope Francis received Bishop Bernard Fellay, Superior General of the Society of St. Pius X. The next morning, Saturday, April 2nd, Bishop Fellay met with Archbishop Guido Pozzo, secretary of the Pontifical Commission Ecclesia Dei. The SSPX French District had invited the faithful on a pilgrimage to Le Puy where a special plenary indulgence is granted when Good Friday falls on March 25 (see our article). It required a year of preparation for the priory of St. Francois Regis to organize this pilgrimage. Because of the reduced access and limited space within the basilica, every pilgrim had to register for one of seven different schedules in order to venerate the black statue of Our Lady brought by St. Louis from the Crusades. On Saturday, April 9, Fr. Christian Bouchacourt, District Superior of France, invited all the faithful to offer the pilgrimage for France, recalling how many saints were connected with Le Puy (St. Joan of Arc, St. Louis Marie de Montfort, St. Francois Regis, etc.) and requested that the daily prayer of the Angelus be offered for the conversion of Muslims. It is from Le Puy that Urban II on the Feast of the Assumption of 1095 launched the first Crusade (1095-1098) delegating the bishop (Adhemar de Monteil) of the city to lead it. The bishop left the city with 400 knights and died during the siege of Antioch. Pope Urban II had also commanded that from the day of the crusade’s departure, and to support it, the Angelus be prayed morning and evening at the ringing of the bells by all of Christianity. I want to firstly apologize to my readers for my absence in posting anything recently, especially during this holy time of Lent. I just recently returned from a Retreat doing the Spiritual Exercises of St. Ignatius, and I had much to do before and after the Retreat that I have been unable to write. Nevertheless, I want to thank you for your prayers and sacrifices, and write a bit about my experience. Some of you may be aware, but for those who are not, the Spiritual Exercises of St. Ignatius are a way of meditating on the state of one’s soul, and once cleansing oneself from the evils of personal sin and mediating upon the reality of death and judgement, one then begins to use the Mysteries of the Rosary – the Joyful, Sorrowful, and Glorious mysteries to contemplate the life of our Lord Jesus Christ. I will begin by saying that this Retreat was such as transformative experience, and I am glad that I chose to go during Lent. Quite fitting it is to consider my earlier writing about Lent’s transformative power, and this was such a perfect way to do this. A soul arrives on Sunday evening, settles into their assigned room, eats dinner with others who are there, and goes to bed considering the many things they will contemplate throughout the week. Souls rise at 6 AM and are constantly engaged in battle throughout the day (through conferences, meditations, prayers, and recollection) until it is time to retire around 9 PM. To properly understand the exercises, one must understand the life of St. Ignatius. St. Ignatius was a warrior; his life’s work as we would call it was to be a soldier. However, at a certain point in his military career, he got injured and was lying in a hospital bed. He asked for some novels about war and conquest, but having none available, he was given Sacred Scripture, the Catechism, and other religious books. Because of this, and because of his abandonment to the Divine Will, St. Ignatius had a conversion of heart, and when he became well, he placed his sword before a statue of Our Lady and consecrated his life for the battle of souls. So, the Spiritual Exercises, as given to St. Ignatius by the Blessed Virgin Mary, share in the spirit of battle; while not a battle of physical combat, the Spiritual Exercises are rightly exercises, they are work, and they are truly Spiritual Combat. A soul will be tempted by the Devil when they consider going on such a Retreat, but do not let such things stop you from the graces that Almighty God wishes to dispense to you for going. Is it difficult to consider your own sinful nature and how just one sin is all it takes to condemn yourself to Hell for all eternity? Absolutely. Is it difficult to consider the pains of Hell and make a thorough General Confession of all the sins of your whole life? Absolutely – but in doing so the soul receives a freedom unexplainable. However, once doing this, we come to a knowledge of the love of God and how we can serve Him once we cleanse ourselves from sin and allow God to show us His ways, and how those ways are the purpose of our existence. In short, the Retreat is to show souls that their first end in life is to know God, to love God, and to serve God, in order to save their soul. You cannot love Him whom you do not know, and you cannot serve Him whom you do not love. Recently, many people have been asking me if I had any specific suggestions for which books I would recommend during this holy season of Lent. While there are many great spiritual classics that are most appropriate for developing an interior life, there are some characteristically sound books which can draw the soul into closer union with Almighty God during this potentially transformative time. Below I have listed various books into specific categories. The Mother of the Saviour by Fr. Garrigou-Lagrange, O.P. Our Saviour and His Love for Us by Fr. Garrigou-Lagrange, O.P. While this list is not exhaustive, there is plenty of reading material presented to last readers for an in depth Lent and beyond. For those readers who wish to go deeper, I recommend the Summa Theologica and Catena Aurea by St. Thomas Aquinas, The City of God by St. Augustine, and The Mystical City of God by Venerable Mary of Agreda which can feed the soul for an entire lifetime. Many of these titles can be found on Amazon, through a quick web search, as well as through Angelus Press. Wishing all of my readers a very blessed Lent! In 1966, Pope Paul VI promulgated a new set of regulations for fasting and abstaining by his apostolic constitution, Paenitemini. These new rules are listed in the 1983 Code of Canon Law, Canons 1249-1253 and all Roman Catholics are bound to strictly observe them. The law of abstinence: this refers to abstaining from meat. The law of fasting: this refers to the quantity of food taken, thus also refraining from eating between meals. *The law of abstinence binds all Catholics, beginning on the day after their 14th birthday. *The law of fasting binds all adults (beginning on their 18th birthday) until the midnight which completes their 59th birthday. What is forbidden and allowed to be eaten? *The law of abstinence forbids the use of meat. This does not apply to dairy products, eggs, or condiments and shortening made from animal fat. *The law of fasting allows only one full meal a day and two smaller meals. The two smaller meals should not equal the quantity of the main meal (which in the United States is customarily observed as the evening dinner). *Eating between meals is not permitted, but liquids are allowed, including milk and fruit juices. *Fish and all cold-blooded animals may be eaten (e.g., frogs, clams, turtles, etc.). *Abstinence is obligatory on all Fridays, except on Solemnities (i.e., I  Class Feasts). *Fasting and abstinence are obligatory on Ash Wednesday and Good Friday. *Abstinence is obligatory on all Fridays of Lent, except Solemnities (i.e., I Class Feasts). The local ordinaries also have authority to grant dispensations from these rules within their dioceses. Here are the traditional rules of fast and abstinence as observed per the 1962 liturgical calendar and outlined in Canons 1250-1254 of the 1917 Code of Canon Law. Who was bound to observe these laws? *The law of abstinence bound all Catholics, beginning on the day after their 7th birthday. What was forbidden and allowed to be eaten? *The law of abstinence forbade the eating of flesh meat and of broth made of meat, but did not exclude the use of eggs, dairy products, or seasonings made from the fat of animals. *The law of fasting prescribed that only one full meal a day was taken with two smaller meals that did not equal the main one. *As to the kind of food and the amount that might be taken, the approved customs of the place were to be observed. It was not forbidden to eat both flesh meat and fish at the same meal, nor to interchange the midday and evening meals. Abstinence was obligatory on all Fridays, except on Holy Days of Obligation outside of Lent. Fasting and partial abstinence were obligatory on all other weekdays of Lent (i.e., Monday through Thursday—Friday was always complete abstinence); this meant that meat could be eaten at the principal meal on these days. *Sundays throughout the year and Holy Days of Obligation outside of Lent cancelled the fasting and/or abstinence of any penitential day which coincided. *If a fast-day Vigil fell on Sunday, the fasting and abstinence associated with the Vigil were not anticipated on the Saturday, but dropped altogether that year. On January 28, 1949, the United States bishops issued a statement modifying the regulations of fasting and abstinence in America (thus differing slightly from the universal laws) after receiving a ruling from the Sacred Congregation of the Council. Liquids, including milk and fruit juices, might be taken at any time on a day of fast, but “other works of charity, piety, and prayer for the pope should be substituted” to compensate for this relaxation. Pope Pius XI granted in 1931 a dispensation to American Catholics from having to abstain on the Friday following the national Thursday holiday of Thanksgiving. The United States bishops had the faculties to dispense the faithful from the obligation to fast and abstain on penitential days that fell on civic holidays. February 9.—ST. APOLLONIA AND THE MARTYRS OF ALEXANDRIA. Every year when we come to the beginning of Lent, I always remind myself of the importance of such a holy season in which the soul has the abundant opportunity to receive grace upon grace, in unnumbered measure. It is in this time that I always encourage those I am entrusted with, and all who will hear, that Lent isn’t just about giving up something for the sake of a tradition year after year. We must make a great sacrifice during this time, and we may even make many sacrifices during this time, but they must be appropriate to our progress in the spiritual life. For, as St. Paul eloquently instructs, “When I was a child, I spoke as a child, I understood as a child, I thought as a child. But, when I became a man, I put away the things of a child (1 Cor 13:11)”. However, sacrifice for the sake of sacrifice does not bode well for one’s progress in the spiritual life. When we sacrifice, when we humble ourselves for the sake of the Kingdom of God, we must also increase in virtue and in ways that expand our religious and spiritual understanding; “Be you therefore perfect, as also your heavenly Father is perfect (St. Matt 5:48)”. Therefore, not only must we make great sacrifices according to our particular progress in the spiritual life and within our state of life, but we must also make choices about which things we wish to take up in the spiritual life that will continue to be with us as we move from the season of Lent into Eastertide and beyond. While some may be accustomed to sacrificing sweets such as candy or ice cream, Holy Mother Church instructs us to do more. 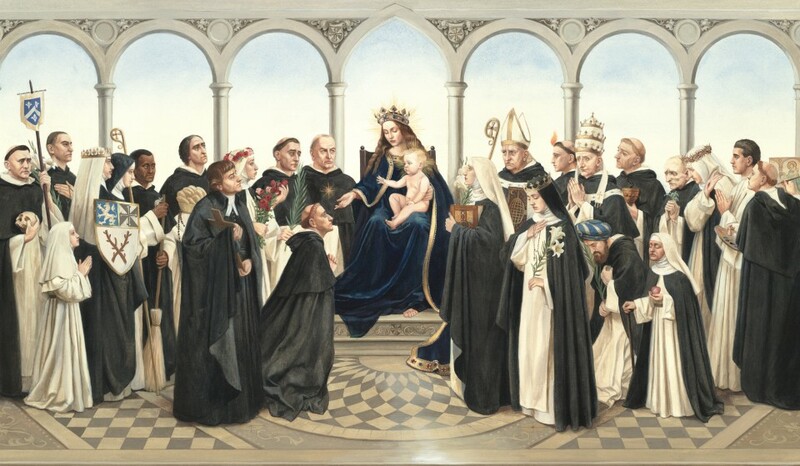 For example, we may make the particular sacrifice of sleeping on the ground so many days a week, or we may choose to pray the Most Holy Rosary kneeling on a broomstick, we may choose to forego the comforts of a warm shower and take an ice-cold shower, or we may even choose other pious practices of mortification such as flagellation with our Spiritual Director’s permission and guidance. But, this is not enough if we forego positive acts of charity and religion which are the crowning glory of the spiritual life. In addition to our mortifications, we may choose to visit nursing homes, we may choose to pray all 15 decades of the Rosary daily instead of just praying a third part of the Rosary, we may choose to attend Stations of the Cross weekly, we may choose to work in community food pantries and soup kitchens helping the poor and destitute, we may choose to learn the Divine Office and unite ourselves to the universal prayer of the Church, we may choose to spend an extra 15-45 minutes in prayer each day as we converse with the God of our Redemption, and we should also choose to increase our love of God by spiritual reading which unites us to God Who gave us our faith, but also our intellect in order to know Him and His Providence for us. In short, let us prepare for and make this holy season of Lent the most spiritually edifying time of our lives; let us pray for the Pope, the Church, the restoration of Tradition, and most especially let us take extra time to learn about the lives of the Saints who have shown us how to be the light in such a dark world. In closing, may we take our inspiration from St. Dominic who was a great Saint that showed his love of God and His creatures by his continued mortification of walking without shoes, sleeping on the ground, intense flagellations, but also by his love of the poor though the giving of alms, but most importantly, by giving the Eternal Word to a world though his example and preaching. May we all come to know the love of God more intimately during this holy season of Lent.